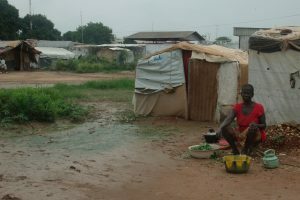 Whenever he extracts a diamond from the muddy waters of the Kadei-Mambere River, Christophe Gounou hums a traditional song of perseverance in Sango, the local language in this war-torn nation. The 33-year-old miner struggles every month to harvest at least 80 carats of raw diamonds, a stock that earns him enough to support his wife and 4-year-old daughter. “It’s difficult, but when I manage to get this quantity, I sell it immediately, and I can earn up to 200,000 CFA francs,” he said with a smile. It’s equivalent to roughly $360 — a goal Mr. Gounou said he sets for himself each month. He and other artisanal miners in a few cities across the Central African Republic are beginning to legally sell diamonds again — some two years after international arbiters partially lifted a ban on such sales amid a period of increased stability. But even as miners in the world’s most impoverished nation revel in the prospect of renewed prosperity, a fresh uptick in fighting in CAR’s south and east is stoking fears that mines once again will fall into the hands of militias who will use “blood diamonds” to fund conflict. “Smugglers and traders are thriving in the parallel black market,” said a report by the London-based watchdog group Global Witness, which took stock of evolving circumstances across several African nations, including CAR. “Violent armed groups that still control large diamond-rich areas in the east, and the strongmen that retain influence in parts of the west, may still be profiting from diamonds that reach international markets with ease,” said the report. Diamonds were once CAR’s largest export, with an annual production capacity estimated at 840,000 carats. That haul made the nation the world’s 10th-largest diamond producer by value in 2012. But the diamond trade came to halt in 2013 when the Kimberley Process, an international licensing body that seeks to prevent the sale of diamonds in war zones, banned exports from CAR after the violent overthrow of President Francois Bozize. A civil war that gripped CAR from 2012 through 2014 left tens of thousands dead. Many say the circumstances were exacerbated by the Kimberly Process diamond ban, which shrunk CAR’s legitimate economy by some 37 percent in 2013 alone, according to the International Monetary Fund. While the ban blocked the legal export of diamonds, analysts say, crooked collectors and armed groups seized on the situation by continuing to sell raw diamonds in cross-border smuggling rings that added to the nation’s economic and political turmoil. Figures from the United Nations show the illegal trade cost the CAR government some $24 million — about 2 percent of its total budget — in 2014. The U.N. Human Development index for 2016 ranked CAR as the world’s poorest nation. Despite the economic strife, outside powers determined in 2015 that stability had returned to enough localities across the nation’s west to allow for a partial lifting of the Kimberley Process ban. By May 2016, certain diamond-rich regions had begun legally exporting again, albeit timidly, said Ernest Mbiroa, a diamond collector in Nola, one of the municipalities affected by the ban. The market is growing, but the pace is slow. In the past two years, CAR has exported roughly 37,000 carats of rough diamonds annually, a far cry from the 840,000 carats a year that were exported before violence broke out in 2012. Although mining operators hope the easement of the Kimberly Process ban will increase prosperity, authorities fear it has opened a new door for blood diamond activity in regions still affected by the ban. A Central African Republic collector was arrested in August in neighboring Cameroon with more than 500 carats of rough diamonds. The diamonds had been extracted from restricted areas of CAR’s east, but authorities said the collector managed to falsely certify the gems in Berberati — a zone no longer affected by the Kimberley Process ban. Francois Alain Ngbokoto, a point person for the Kimberley Process in CAR, said the seized diamonds had come from Bria, a locality about 250 miles from CAR’s capital of Bangui that remains entrenched in conflict and controlled by armed militias. He said Kimberley Process authorities have sought to implement a storage and marking system to address difficulty that officials are having in preventing blood diamonds from blending with legal gems. A green slip denotes transactions in CAR’s western provinces that are no longer under the Kimberley Process ban, while a red slip denotes diamonds from conflict-ridden zones in the east. The regulation measures have a downside, said Mr. Ngbokoto, who pointed to Kimberley Process estimates that militias in CAR have stockpiled more than 60,000 carats of rough diamonds mined in areas the militias still control. The Central African Peace Unit (UPC) is one armed group accused of controlling mines and selling diamonds to bolster its arsenals. Local authorities say the UPC employs about 2,000 men who control about a dozen localities in the eastern part of the country. Representatives from UPC deny that the group is dealing in diamonds. “We do not have a collector or a mining artisan at the UPC. 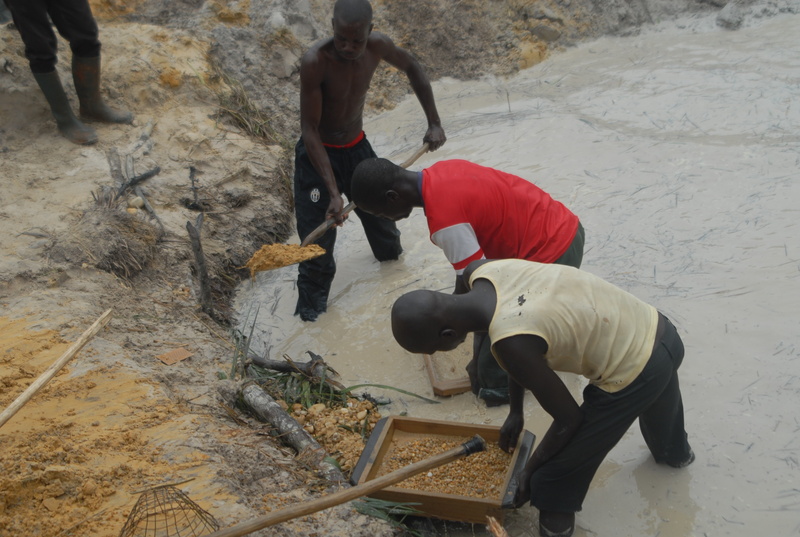 I have never seen gold or the diamonds with my own eyes,” said Souleymane Daouda, a spokesman for the group. In Bangui, meanwhile, Mr. Gounou said he has continued to work often in mines — both in CAR’s east and the west — despite the increasing intensity of conflict and the presence of armed militias in some areas.